Too embarrassed to open your garage door because its too cluttered? Not anymore. Junk In The Trunk is expert in junk removal and hauling services and garage organizing services. We help people in Fayetteville and surrounding communities like Cumberland, Hoke, and Harnett counties and more. After years of piling up on various assets at different points in any family’s life, it is almost certain that your garage will be cramped up and airless. Not anymore should you holla at us! 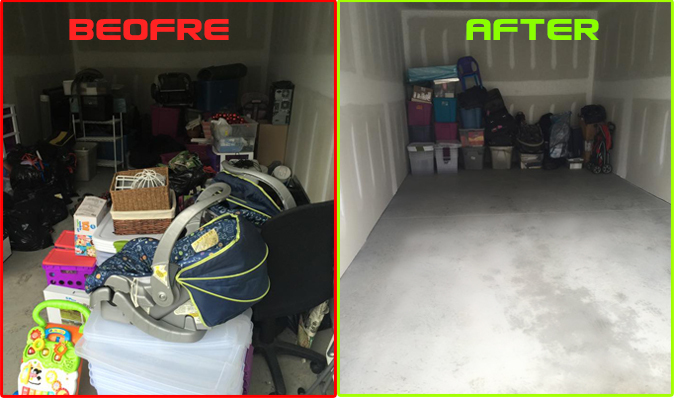 We are willing to clear up your garage regardless of the nature and sizes of the junk therein, and the best part is that we do this for free! Our payment for this service comes in the form of the stuff you don’t need anyways – we tow them away so that you can finally get room to keep stuff that you actually need! Obviously, as already stated, we do not merely come over to take away the junk from your garage or shed. We go much further to clean and organize the space so that it is ready for your consumption-think of it as a kind of liberation that comes with a clean-up after decluttering! Our services are convenient, regardless of the reason for seeking decluttering services; whether you are renting out your property, are moving out, or are merely looking for more space to safely keep newer, more relevant assets. Even better for you is the fact that we do not choose a “job size” to respond to when called out on a garage-cleaning mission! From a few appliances and old furniture to two old vehicles or more, we have the ability to come to your rescue! So go ahead and give us a call, its high time you created a bit more room in that stuffy garage! Junk removal. We remove almost anything that clutters your life including: appliances, furniture, donation items, construction material, and landscaping debris. Garage Cleaning. Do you have extra items lying around that you no longer need but just haven't had the chance to take them and drop them off at the donation center? If you answered yes, then I am at your service!